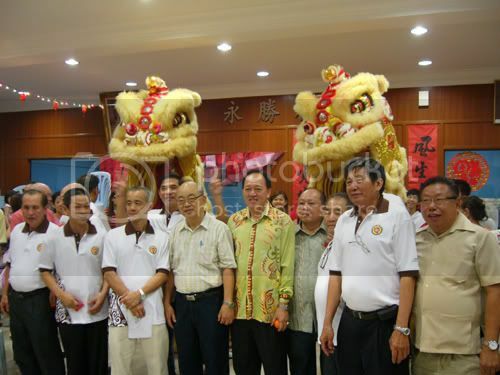 It was an yearly CNY group visit at Peng Clan Association at their activity center in Cheras. This association having all Peng Clan members who carry surname of " 彭 " - Peng, Pang, Phang and etc...all Mr. Mrs Pang, Miss Pang, Madam Pang, Datuk Pang will gather together there to celebrate this day. Last Saturday (6th March), we went for it. It starts at 6.30pm. Due to heavy rain, we only manage to reached by 8pm. The programmes of the evening include lion dance, ang pao and mandarin orange distribution, karaoke, lucky draw and etc. For the food wise, they served Hakka dishes - "lui cha" and some other buffet foods. Once we reach, the lion dance started shortly. 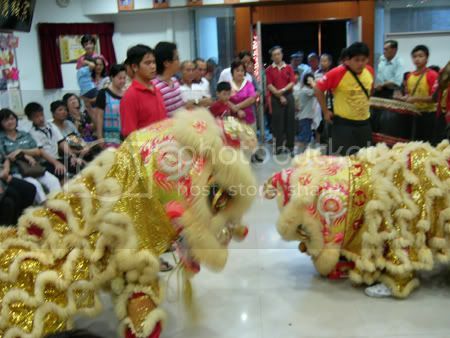 It was Terry's first time watching the real lion dance besides from books and TV. It was not really that bad terrified him for the loud drum noise and 2 big head lions. Far better than meeting Santa Claus, LOL! We both take turn to carry him to watch and sometime he hide his face from looking at the lion. I kept encourage him to watch by seeing a big group of kids surrounding the lion head without any fear. The lion make greeting to the VIPs while passing them oranges. When I'm sorting out the pic, I only realised that I captured him. Familiar face? He is Tan Sri Robert Phang, lately there were some news related to him with MCA Youth Chief Datuk Dr Wee Ka Siong on PKFZ scandal. He is the Advisor of the Association. Name of the main hall with FIL's last name. After the lion dance and ang pao distribution, I only started to eat. Since late already the food left not much. I somehow got click to a member Mrs. Pang there. Every year she was so looking forward to see me there. She (Su-San) a mother of 2 boys. We known since year 2008 on a very unfortunate day in hospital, when both of our son hit by burn. We met at the same doctor's clinic, admit to the same hospital, did the burn operation on the same evening and also stay next to each other in the same room. Some medical staff was thought that this both young patients are "brother". Ya, can consider so, since they both have the same surname and the middle one too - "Pang Chee Xxxx". Her son that time was only a 8 months old baby, burned by hot iron at his right thumb when riding on walker. From there on later, we keep contact on the phone to check out our son well-being and recovery. Till now, we still have lots to share, especially on what to use on the scar for better recovery and the changes and fear in them after the accident. Hopefully soon we will catch up again. A great experience for Terry. 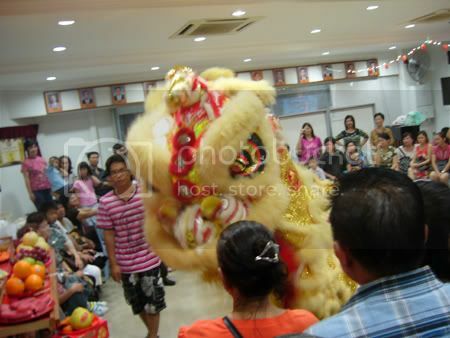 So far my gal saw once only for the Lion dance during CNY. Your FIL is the president but how come your hubby not a member yet? Such a strong clan. Interesting.